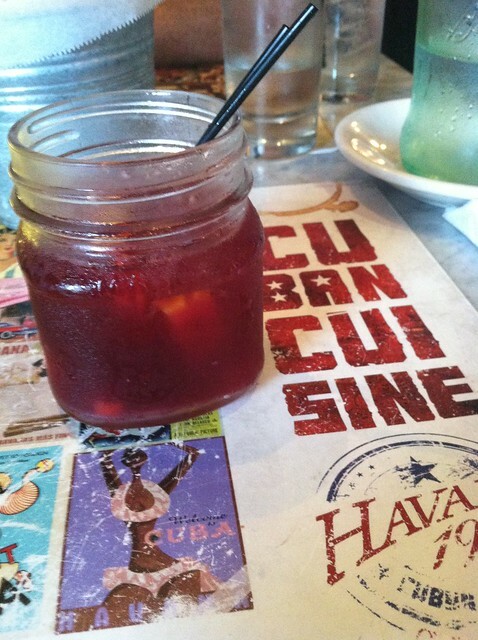 A Foodie Bibliophile in Wanderlust: Who doesn't visit Miami just to eat Cuban food? I thought everyone did that. Who doesn't visit Miami just to eat Cuban food? I thought everyone did that. One of the main reasons I wanted to visit Miami this past summer was because, as a foodie, I love experiencing the authentic food of a culture. Sure, I'd had Cuban food before, at various restaurants in the Midwest, but I wanted be at the pulse of where Cuban cuisine in America began and where it is the most authentic. 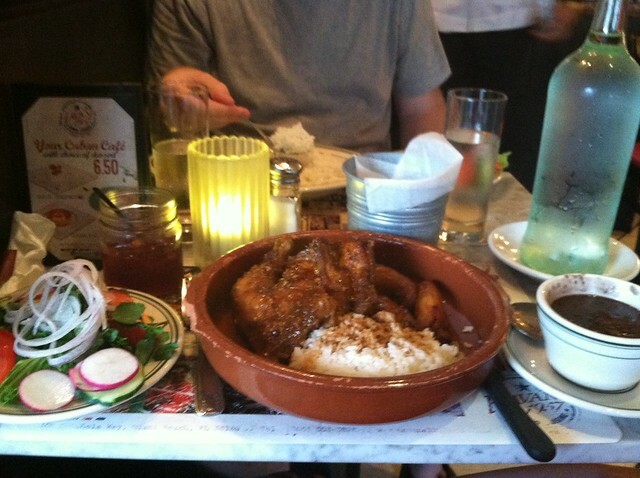 Needless to say, we ate quite a bit of Cuban food in Miami, but there were two meals that really stood out. Walking into Versailles for lunch is an incredible experience. When you walk into the cavernous dining room, the first thing you notice is how packed full of people it is. But then after you notice the sheer number of people, as you sit at your table, you start to observe the wonderful diversity of the patrons: all kinds of people, black, white, Hispanic, tourists, business people on their lunch break, people speaking English, Spanish, Spanglish, it is just a melting pot of humanity in one restaurant dining room.The sheer diversity of patrons alone told me that this was going to be a great meal. 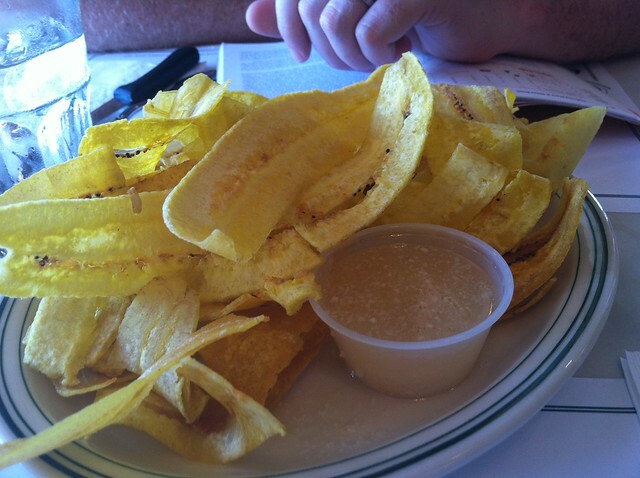 For an appetizer we ordered green plantain chips with mojo. As someone who lives in the Midwest, plantains are not something you really see in our region of the country very often. But they are a staple Cuban cuisine, and I have to say, plantain chips are more addicting than potato chips, especially when you dip them in the garlicky, citrusy mojo. For my main meal I ordered a Cubano, a traditional Cuban sandwich, which is topped with ham, roast pork and Swiss cheese, on toasted Cuban bread with mustard and pickles. 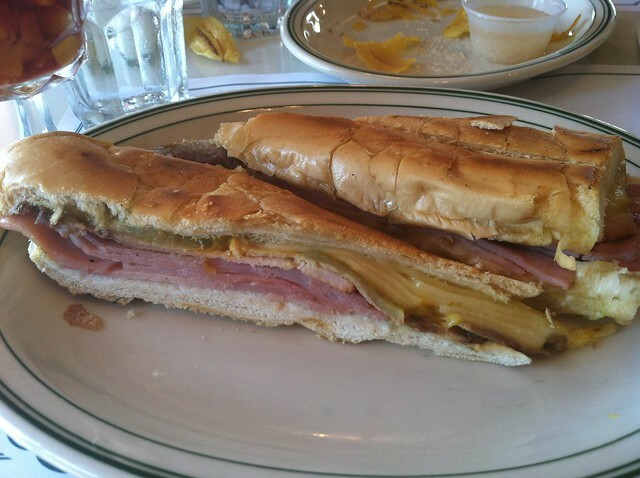 There aren't many perfect sandwiches in this world, but the Cubano is one of them. So many wonderful flavors and textures and the bread truly makes this sandwich what it is. I wish Cuban bread were easier to find in Michigan. I would use it on every sandwich I make. I also ordered a side of black beans, which sounds simple and unremarkable, but Cubans do something magical to their black beans and I need to figure out what it is. I'm off to investigate after I finish this post. 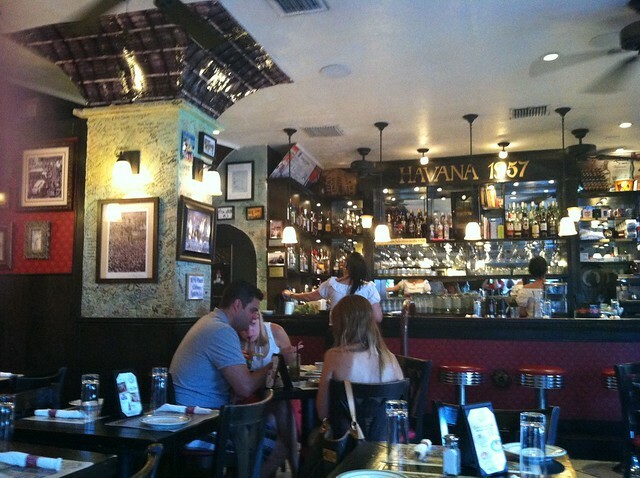 Our second memorable Cuban feast in Miami was at a small restaurant in Miami Beach called Havana 1957. 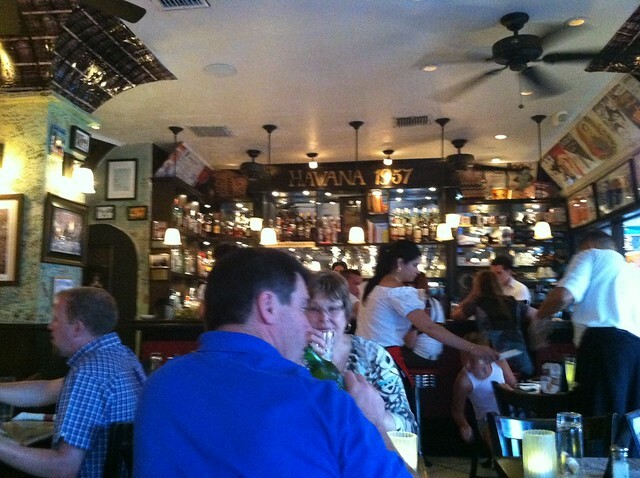 The main dining room is quite small, yet it really does feel like you've been whisked away to 1957 Havana. When we first arrived, there were only a couple other patrons in the dining room, but by mid-meal, the whole place was full. For my main course I ordered a marinated chicken dish with rice and black beans that was so delicious I am still dreaming about it. I would go back to Miami Beach just for that meal (oh, and the warm, blue crystalline water too). I don't even remember what was in the marinade for this chicken, but I can still taste it. Whenever I travel I try to remember to embrace the cuisine and culture of the place I'm visiting. Miami is a city where you are hard pressed not to embrace Cuban culture because it is so pervasive. I mean, is there any better way to get to know a culture than through its food? It is the great unifier. I've found that it's incredibly refreshing to just ADMIT that I go on vacations for the food. The scenery is nice, too... but food (and a bookstore or two) are the real stars. Glad you had such nice meals in Miami - that sandwich is making me drool all over my keyboard! YUM. 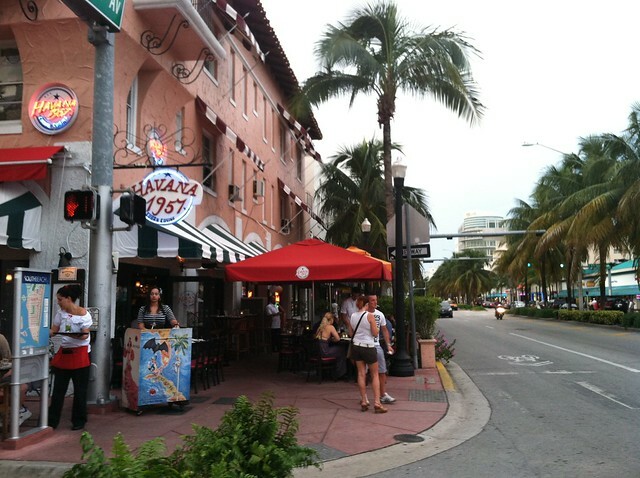 We're going to back to Miami in February and I'm putting these two restaurants on my list- thanks for the tips! Some of my best memories of my travels center around the food. I too make sure I'm eating local food, often at local restaurants or cafes away from the more famous places. Each meal you described sounds *awesome* -- in fact, I'm thinking of making black beans this week. I wonder how hard the Cuban bread would be to make. It seems softer than some of my recipes for sandwich rolls and would make a nice change. It looks like you had a lot of fun on your vacation. Nice photos. I know what you mean about Cuban black beans... hope you'll do another post if you find the secret! I have never really have much Cuban food, but it sounds wonderful and I always like black beans and rice. I love Cubano sandwiches. I the pickles just make it. And I love beans. I've figured out delicious refried beans. I've never had Cuban food before and everything here looks delicious. Thanks for the drool-worthy report! I have only had plantain deep fried as prepared by my Nigerian ex. I haven't actually tried it as chips. Love this post! Food is definitely a good way to explore a culture! I've only had proper Cuban food once and that as n ft lauderdale, pretty close to maim! It was very good, I still think about the plantains and it was a really long time ago.